Archaeologists have discovered a large structure – to the northeast of the 4,600 year old Bent Pyramid – which may be the remains of an ancient harbour. It connects to one of the pyramid’s temples by way of a 140 meter long causeway. 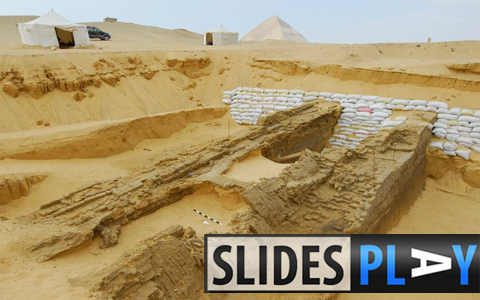 The discoveries were made by a team from the Cairo department of the German Archaeological Institute, and the Free University of Berlin. The team used magnetic survey and drill cores soundings to make the finds. The structure is mostly unexcavated and only a portion of the causeway has been unearthed. Harbours are known from later Egyptian pyramids and may have served as a receiving point for the body of the pharaoh. It is unlikely, however, that the newly discovered structure was used for the burial of the Bent Pyramid’s creator – the pharaoh Snefru. It is widely believed by Egyptologists that his final resting place was the Red Pyramid, located two kilometres to the north of the Bent Pyramid. Snefru was the first ruler of the fourth dynasty and constructed two pyramids at Dahshur (the Bent and Red Pyramids), one at Meidum, and one at Seila. These were the first “true” pyramids – those with smooth sides. After he died, his son Khufu inherited the throne and began construction of the Great Pyramid at Giza. The causeway runs due east of the temple and has a vaulted roof. This appears to be the earliest known instance in which a roofed causeway was used in an Egyptian pyramid complex. The interior of the causeway contained a passageway more than 2.5 meters wide. Its walls were lined with undecorated white and yellow plaster which appears to have been maintained for a long time. Archaeologists are not certain why Snefru went to the trouble of building four pyramids in Egypt. The Bent pyramid, as its name suggests, has an odd angle – with a slope that looks like it was changed part way through construction. It has been suggested that this was an error made by workers trying to grasp new construction techniques. However research done by the German team suggests that the geology of the plateau played a role in the pyramid’s odd shape. Therefore, “for the area of the pyramid plateau a direct anthropogenic relief forming influence has to be considered.” In other words – humans altered the shape of the plateau. Alexanian said that flattening the plateau would “make the view from the cultivated area even more dramatic.” People would have seen a flat, sharply edged, plateau, with a pyramid built on top and possibly a canal leading up to it. A sight that would make someone living 4,600 years ago gasp in awe.